Perhaps the single most devastating book I have ever read...http://abitterdraft.com/2013/09/salute-the-dark-by-adrian-tchaikovsky.htmlAfter I finished Blood of the Mantis, I immediately sent an email to Pyr asking after the rest of the series and they obliged. I soon found out that Pyr didn’t have plans for anything after book 5, The Scarab Path, which is a shame because they format the books to be a bit taller, shortening the page count in exchange and making the books more feasible and less daunting. Not to mention having the beautiful covers designed by the very skilled Jon Sullivan. In the review, I also wrote about how quickly Shadows of the Apt was becoming my favorite series to date. After Salute, there can no longer be any doubt - Apt has taken the throne by force.The world of the Apt and Inapt is in total war. The expansionist Wasp Empire is sweeping across the Lowlands and any outlying city that sparks a glint in Emperor Alvdan II’s eye. War Master Stenwold Maker’s agents are scattered everywhere in attempt to give the Lowlands any sort of advantage against the encroaching horde. Cities like Sarn and Myna are in open rebellion. Plots and twists are commonplace. Everything that has been building up over the first three books in the series culminate in Salute the Dark.One of the highlights of the series is how Tchaikovsky manages to weave cultures of our world into the story and make them feel so real. The Solarnese feel genuinely like Renaissance Italians, the Wasps like the Romans or various other empires, as well as many others. Some of my favorite scenes from Blood of the Mantis took place in the sky – in orthopters, heliopters, fixed-wings, and even huge insects. The aerial aspect returns in Salute the Dark in much greater scale. To put the culture in perspective – just prior to World War I, some of the first stable propeller-driven aircraft began to be manufactured with the purpose of war in mind. People were drawn to these fascinating machines, and throughout the war the pilots styled themselves knights of the air. 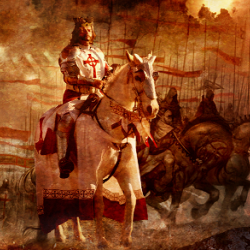 There was a distinct system of honor in the aerial part of the war, drawn from some branch of chivalry that medieval knights adhered to. Pilots would rarely aim to kill in their dogfights, their dances in the sky – they’d aim for wings, the rudder, anywhere but the cockpit. It was an almost unspoken rule – if you hit someone’s engine and they could no longer fight, they’d glide to the ground in an attempt to land and, for the most part, would not be pursued – this counted as an aerial victory. Tchaikovsky implemented these same chivalrous ideals – the early tech of the vehicles, the aerial chivalry – into Blood and Salute, making the story feel that much more vivid.Whereas Dragonfly Falling had some large battles and sieges in it, Salute truly felt like a total and utter world war. Sieges, rebellions, field battles, ambushes in the black of night, cavalry charges, aerial battles, flamethrowers, and even some horrific chemical warfare that felt all too real. Not only did the story include these traditional aspects of war, there was also an entire thread of gladiatorial combat with a huge culmination, again reminiscent of the Romans. People are reduced to savages in the audience, where skill is a non-factor for entertainment on the sands. The only thing that matters is that blood is spilled and in great quantity.Salute the Dark is an incredibly apt name for the story. It is absolutely brutal. My heart was racing whenever I picked it up to read. Nobody is safe – you can feel the danger seeping from the pages. Aside from a few average characters of no outstanding martial quality, there is an abundance of characters in Shadows of the Apt who are peerless in combat, able to cut down enemy after enemy without breaking a sweat. After finishing Salute, it almost seems like Tchaikovsky purposely used that trope of fantasy – the nigh-invincible swordsman or mage or rogue – just so he could turn it on its head and smack you in the face with it. This is real, visceral, brutal war.Thus ends the first arc of Shadows of the Apt. Ties are wrapped up, but there is a definite sense of foreboding that has me compelled to continue the series. 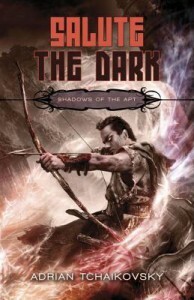 Unique in culture and character, massive in scale in every sense of the word, Shadows of the Apt has become my favorite fantasy series of all time and Salute the Dark is one of the best books I have read this year. If you haven’t even started the series, you are really, really missing out.